We are nearing the end of the series of articles devoted to the comparison between original Viro products for bikes and some imitations which can be found on the market. As mentioned in the other blogs of this series, the victim of imitations is obviously the one to have first designed and launched a successful product on the market. 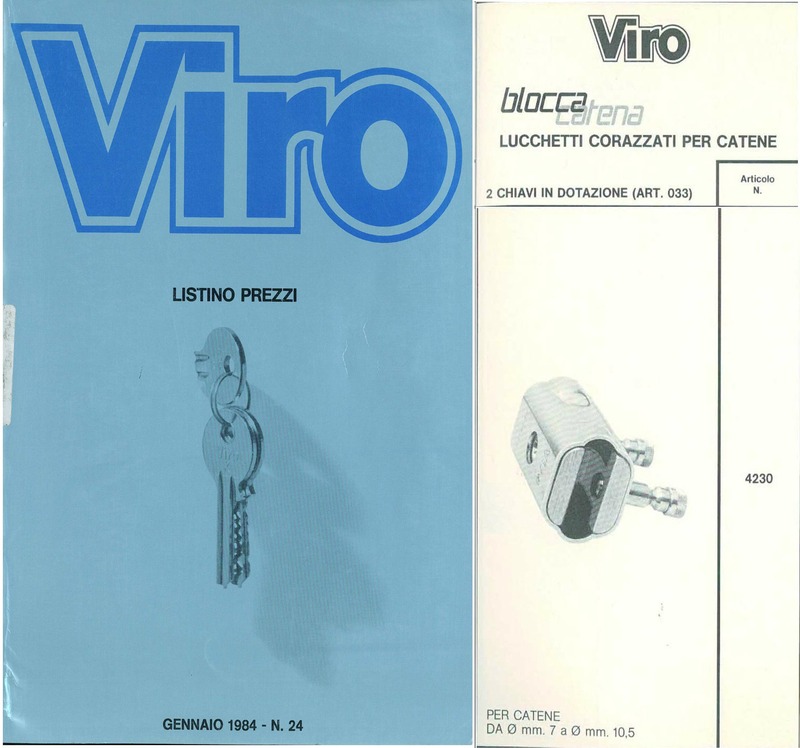 So we will show how the Viro “Blocca Catena” is the result of Italian ingenuity, with its design dating back more than 30 years, as shown by the page below from the 1984 Viro catalogue, when it was introduced for the very first time. 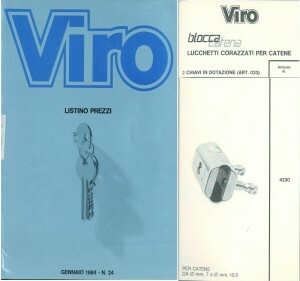 Let’s now talk specifically about the “Blocca catena” padlock with a 10 mm chain and a product which, except or the colour, appears to be identical. But there are differences; let’s look at them together. 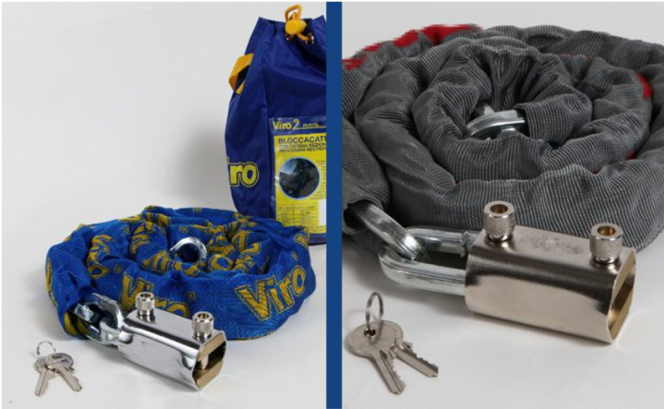 As just mentioned, the difference which first catches the eye is the colour of the two products, and not only that of the sheath of the chain; the original Viro padlock has a smooth and shiny chrome-plated “mirror” finish on the surface of the steel armour, whilst the copy has an opaque chrome-plated satin finish. It might seem to be purely a question of appearance, but it’s not. Indeed, only a perfectly precise and constant machining of the materials provides a “mirror” finish, whilst, when you want to “disguise” production inconsistencies and imperfections of machined surfaces, or of the materials themselves, it is necessary to resort to a satin surface finish which makes everything less defined. The proof that the copy has withstood far less chemical treatment than the original Viro product has been provided by the results of thesalt spray test (this is a process of “accelerated aging” by creating, in a special machine, an extremely hot, humid and corrosive atmosphere, where the products undergo, for every hour of the test, approximately the equivalent of one week’s exposure to every type of aggressive atmospheric agent). 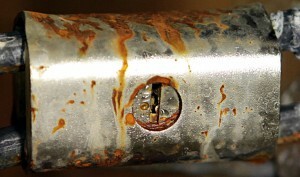 In fact, after 40 hours of salt spray testing, which corresponds to approximately a year of life in a real environment subjected to harsh weather conditions, the armour of the imitation padlock was considerably damaged and oxidised in may points, which is a clear sign of poor resistance to corrosion, due to very limited chemical treatment. In addition, as we will see in a video in the next blog, the internal mechanism is completely blocked by corrosion and can no longer be operated with the key. 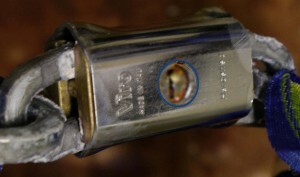 On the other hand, the armour of the original Viro product, when undergoing the same test, was not affected by corrosion (only the anti-drill plate showed signs of oxidation but, as will be shown in a video in the next blog, this does not affect in any way the functionality of the product). The copy in our possession has a defective lock-bolt, which comes off only by pulling it manually to open the lock-bolt. 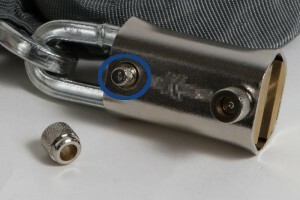 Apart from this, which might be a defect of the single sample being tested, the photo shows how the head is not only not fixed by a rivet which is large enough to avoid with certainty that this event would not occur, but, much more seriously, it has not been designed so as to prevent the lock-bolt from being pulled out. If you try to pull out the lock-bolt, by gripping it with burglary tools, the head does comes off, but it leaves beneath it a knurled grip which is quite handy for grasping the lock-bolt again and pulling it off. On the contrary, the heads of the lock-bolts in the Viro padlock are designed with a specific programmed breakage point, that is to say, if they are pulled with burglary tools they break, so as not to create additional gripping points, leaving the lock-bolts in place and the padlock closed. As we have already seen in the previous comparisons, also in this case the copy has a common square-link chain, whilst the Viro chain has semi-square links which are more difficult to attack with cutters.In effect, the semi-squared profile is more complicated to grip with shears, which generally have blades suitable for cutting round profiles or, sometimes, square profiles, but blades do not exist which are suitable simultaneously for both types of profiles. The section on the left is semi-squared, characterised by a square part and a round part; the section on the right is square, characterised by all right angles. 4) Length of chain links. This is also a common feature in all comparisons performed so far. The Viro chain has very short links, in which it is harder to insert a lever or a cutter, and which are more resistant to attempts to widen them; the chain links of the copy are almost twice as long, making it more vulnerable to attacks with burglary tools. Obviously, with the same overall length, a chain made up of a greater number of short links has a higher manufacturing cost, because it needs more material to produce it, but just as obviously, for the above-mentioned reasons, a short link represents a considerable advantage in terms of security. The Viro “Blocca Catena” is made Italy, whilst the copy is made in the Far East. 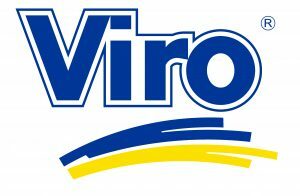 A Viro Made in Italy product offers a much better performance, a greater reliability over time and, above all, the certainty of a consistent quality, whereas the quality of cheaper imported products is always very variable depending on the production batch. These are merely 5 features which can be clearly seen with the naked eye. In the next blog we will show, with the use of other photos and videos, how the strength tests highlight other fundamental differences. As already mentioned, we will see that the copy has a much lower resistance to weathering than the original Viro product and that its chain, whilst having the same 10 mm cross section as the Viro product, has not undergone any case-hardening and tempering. It is therefore very soft and can be easily cut with a simple hacksaw. We will also see how the attempt to pull off the lock-bolts is able to open the imitation product, whilst the original Viro product is well protected against such attacks. See the characteristics of the Viro “Blocc catena” padlock with 10 mm chain. This entry was posted in Locks, Motorbikes and Bicycles and tagged locks on 25 May 2015 by Mara Rossi.